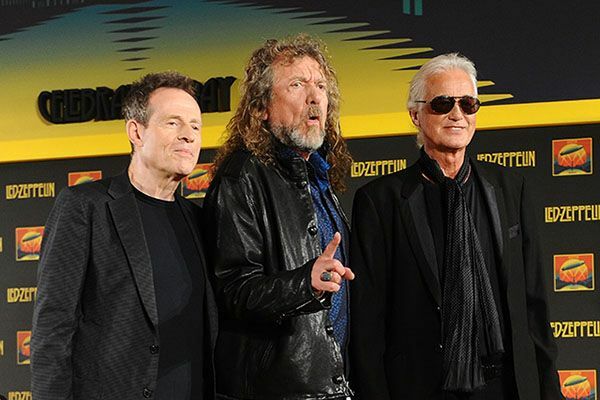 On December 10, 2007, the surviving members of Led Zeppelin — Robert Plant, Jimmy Page, and John Paul Jones, plus John Bonham’s kid Jason — reunited for a one-off concert at London’s O2 Arena in tribute to the co-founder of their former label, Ahmet Ertegun. More than 20 million people tried to get tickets; only 18,000 were successful. Yes, you could say that Led Zep is still a pretty popular rock band. Now that concert is set to be released in film form as Celebration Day, first as a limited-run theatrical release on October 17, and then in multiple audio and home video formats on November 19. Which is all fine and good, we guess, but wouldn’t it be sweet if Led Zeppelin made a bustle in your neighborhood hedgerow — or at least a hedgerow within reasonable road-trip driving distance? We’re pretty sure the world would pitch in $1 trillion to make that happen. Alas, Jimmy Page is already rich in money and Satan’s power, so it’s not likely that the band will be getting back together anytime soon, as he recently told Rolling Stone. “I think if there had been any more concerts to be done, we’d already be talking about them. So I don’t see it,” he says. So, back to Celebration Day. All we’ve seen of the O2 show before now comes from videos on YouTube, many of which are surprisingly well-assembled packages of breathtakingly crappy shaky-cam footage taken of the entire two-hour performance. It is simply some of the most thrilling and visceral rock music you’ve ever heard coming out of an iPhone. As for Celebration Day — which was shot on 14 cameras and given the full “helicopter attack scene in Apocalypse Now” treatment — we’re guessing it will rank higher than Crosby, Stills, Nash & Young’s CSNY/Déjà Vu Live on the old-guy classic-rock live record reunion scale, but perhaps not as high as Cream’s Royal Albert Hall: London May 2-3-5-6 2005. (Royal Albert Hall is really quite good!) But we look forward to finding out for sure before filing Celebration Day between Coda and How the West Was Won in our Zeppelin collection. Here is a trailer for Celebration Day.